From Zion and Bryce to Yellowstone with an overnight in Layton, Utah. 326 miles on the first leg and another 336 the next day and we are here at Henry’s Lake State Park in Idaho about 15 miles from West Yellowstone, Montana where the west gate of Yellowstone National Park is located. On our first day in the park we had to see Old Faithful and she cooperated faithfully. On the way we stopped to look at: “ojo caliente”, geyser pools, mud pots, and steam vents. The weather was perfect, the sky was blue, very light breezes, and temperature in the mid 70’s. Reading the signs taught me that some of the pools had a ph of 1-2. That is as strong as battery acid! Combine that with the fact that some of pool temperatures are as high as 210 degrees and you have one dangerous scenario. They are truly wonders of nature. I also overheard a park ranger explain that the pools appear blue because they are white inside and that water transmits light in the blue portion of the spectrum best. I was also taken by the beauty of the scenery and especially the wild flowers. On Day two we saw Mammoth Hot Springs. as were the Artists Paint Pots. We also saw deer, chipmunks, squirrels, bison, tourists, fishermen and more wildflowers. On the 20th we toured the surrounding area where we saw Hebgen Lake and the earthquake dam that created Quake lake. 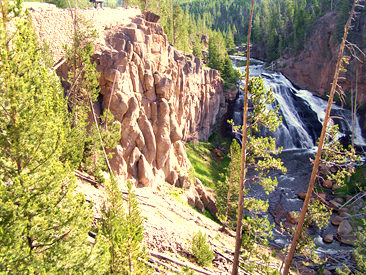 In 1959 an earthquake caused a landslide that dropped 80 million tons of rock into the Madison River completely blocking the stream and creating Quake Lake. We then went to 3 antique and craft sales followed by an art show where I met a very friendly artist who did wonderful marquetry. Today, 7/21 we simply relaxed and got ourselves ready to head to Montana and on to Spokane to see kids and grand-kids. Our Campsite at St George Resort. I never got this picture in when I should have. Drove up through Zion to get to Bryce Canyon. On our way we had to stop for this bighorn sheep who spent some time staring at us from his “perch” in the middle of the road. It took about 2 hours from Hurricane to Bryce but in addition to the bighorn we saw buffalo, wild turkey, squirrels, and chipmunks. The canyon was beautiful and definitely worth the time and effort to get to it. We went to most of the lookouts and the views were all awe inspiring. The weather was a bit cooler than we expected. We are now official Arizona pansies. 59 degrees was downright chilly!! We took a different route back and went to Cedar Breaks National Monument. The wildflowers were blooming which added much pleasure to this stop. On the last leg of our journey back to camp we had to wait for a large herd of domestic sheep that were being driven down the road. Now that is a coincidental end is it not? We only made two stops on our way from Page to Hurricane. On our first stop we checked out a trading post in Kanab, but did not find much of interest. Our first stop at Zion was at the visitors center where we picked up a map and then we hopped on the shuttle. The Court of the Patriarchs in Zion National Park are sandstone cliffs named for three towering figures of the Old Testament. They hold court over Birch Creek Canyon and that section of the Virgin River. In 1916 Frederick Vining Fisher, a Methodist minister, gave the religious names to the peaks. On the left you can see Abraham Peak (6890 ft), in the center you’ll find Isaac Peak (6825 ft) and on the right, almost hidden behind Mount Moroni (5690ft), is Jacob Peak (6831 ft). Next we hiked one of Zion’s signature trails, up to the lower emerald pool. There is an algae that turns the water green, hence the name. The hike was about 1.2 miles. (Uphill both ways.) Lots of wonderful trees, box elder, maple, cottonwood, chinquapin oak, bur oak, juniper and a host of others. It was refreshingly cool and misty at the pool. The trail at the Temple of Sinawava is actually just the beginning of the Virgin Narrows Trail. The towering sandstone cliffs soaring on both sides make you feel small and even insignificant. The trail follows the river upstream from a beautiful wooded area up an ever narrowing canyon. The scenery is must see awesome. Alright this is one of those really bad puns that I enjoy. And finally for today a little somehing “strange”. I was unable to find out anything about this unusual site. About halfway between Hurricane and Zion on Hwy 9 this curious “attraction” awaits your notice. Drove from Camp Verde, AZ to Page, AZ today. We got fuel for $3.679 per gallon on Rte 66 in Flagstaff. Gas Buddy (an android app) help me combine price with convenience. Maybe that is a good omen for the trip. It was still over 110 on all the 6% grades coming up here and the truck performed well as we never had to shut down the ac to avoid overheating. Only spent one night in Camp Verde even though we like this picturesque pine tree and Navajo sandstone area. We are anxious to see new sights. On the way from Camp Verde to Page we made numerous stops but the most interesting was at Cameron. The trading post had everything from fine Navajo arts and crafts to made in China tourist stuff. Elaine found and purchased some nice hand spun wool yarn. Right next to the store was Tanner’s Crossing Bridge. It was built over a gorge of the Little Colorado River at the edge of Navajo and Hopi Indian country in 1911 by Midland Steel. This sway-back, one-track suspension bridge on US 89 was orphaned in 1958 by the modern two lane cantilever truss bridge that you can see behind it. Just had to stop and take a picture of the beautiful red mountains. And now for some of that worthless trivia I promised. There are on average 61,000 people airborne over the U.S. in any given hour. Drove to Camp Verde, AZ today. We got fuel for $3.399 per gallon near Casa Grande. Gas Buddy (an android app) help me combine price with convenience. That is the least I have paid for fuel in a long time. I think we got all the mail and garbage issues resolved even though it required a stop before we got out of town. It is July 8th and we will be leaving tomorrow. The packing and checking are done so it is time to shut down Cielo Isla, our home base. We are already living in Hannah since that made it easier to finish the cleaning and do all the systems shutdown and final lock up. Appliances, radios, etc. are disconnected to protect them from power surges and spikes. Water is shut off to dishwasher, refrigerator, and washing machine because they are all vulnerable to leaking. The water softener has been drained and locked out of the water system. The UV water disinfection system has been turned off. The water heater has been turned off. The gas supply to the barbeque is turned off. Elaine’s car just got a lube oil filter and a fresh tank of fuel with fuel stabilizer. It is also hooked up to a battery minder, so it should be ready to go when we get back. Our mail is being forwarded. Hannah has plenty of fresh water to start the trip. My tool kits are loaded. We have cameras, computers, maps, books, charging devices, spare glasses, mp3 players, batteries, and light bulbs. Hannah’s freezer is packed, refrigerator stuffed, pantry loaded. Patio furniture, hoses, and misc garden “stuff” is all stowed in the garage. Well so much for the best laid plans of mice and men. The mail is still showing up in our mail box!! We will leave a note for the mailman in the box and delay leaving in the morning so that we can go to the post office again and hopefully get things working correctly. Super emergency back plan has our very good friend Joan collecting and forwarding it for us. Hope it doesn’t come to that. Also when we called to put the garbage on vacation plan the office told us that because of the 4th of July holiday our last pick-up would be Friday and not on the usual Thursday. Well that did not happen either!!! So we will put the garbage out Monday before leaving and another good friend Danna will bring the can in Monday night. All would be lost if it were not for wonderful friends to impose on. I am sure we forgot something and I am also sure that I did not list some of the preparations we completed. Since Elaine will be driving the first leg I hope she does not forget me. I know that won’t happen because she won’t drive though Phoenix towing Hannah so I am safe for now. Hannah is a 2010 Keystone Montana 2980RL. She is our home away from home. I have made and installed many things to make traveling easier and more fun. Below you can see some of them. Believe it or not, almost all rv’s have the same lock and key combination for their storage bays! I replaced all my bay locks for security and piece of mind. If you would like to do the same just “Google CH751”. It was not difficult or expensive and the folks at Industrial Lock & Hardware were very helpful. Now my tools and equipment are much more likely to be there when I need them. All the available drawers in the bedroom were approximately 7 inches deep which is fine for some things but very inconvenient for small things that you want instant access to such as your toothbrush, toothpaste and razor. 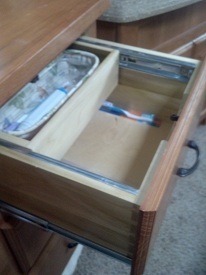 As I did not want to get into matching the detail, wood and color of the bedroom furniture I salvaged the drawer fronts and built two new drawer boxes with a shallow drawer box to slide back into the cabinet when access to items in the lower part of the drawer is desired. The top section is rolled back in the picture. And yes, for those who know me those are all hand cut dovetails on the boxes which makes them the strongest and nicest looking drawers in Hannah! We really needed a night light for the bathroom that would work off the battery and consume very little energy so we would not have to be concerned about running down the batteries when “boondocking”. This is my solution. A three lamp LED provides enough light for safety without being obnoxious. As currently wired we can have either 1 or 2 of the lamps on or we can of course turn it off completely. Just a single pole double throw center off switch, a small resistor, 3 super brite LEDs, and a little hookup wire and all is good. With one lamp on, as shown in the picture, the current draw is only .007 amps! I could run the night light for months and not run down the batteries. The lamp will still function as it originally did. The main storage bay, which I call the basement, will hold a lot of equipment and supplies, but would quickly become a huge aggravation without organization. I have installed hangers, brackets, hooks, clips and permanent storage places in addition to misc. containers to keep things neat, clean, and accessible. What can I say, my wonderful wife has been married to a cabinet maker for more years than she would care to admit. In trade for putting up with a continuous trail of sawdust everywhere she obtains the convenience of pull out shelves wherever I can fit them. We really needed a place for at least a few cookbooks and we really wanted a little more counter space. This is the solution attached to the end of the kitchen peninsula. With the matching solid surface top I made for it, It looks like original equipment. It holds a varying supply of books and often is the home for a toaster oven. Space is always a premium! This is the bentwood oak magazine rack I made to keep the current reading material at hand as we travel. And we have a place to hang swimsuits, wet coats and hats, and anything else that needs to drip dry. I made it by heat forming plexiglass. It is attached over the shower with stainless steel screws and will accommodate regular hangars. Some more storage solutions, custom fit to our needs.